It's All About the Benefits. Packed with over three hundred new features, UDA ConstructionSuite delivers powerful project management tools integrated with new ConstructionNet CRM. Read on to see how UDA ConstructionSuite components and features can benefit your business. Reduce risk and increase profits with comprehensive, precise estimates that cover the entire scope of the project. 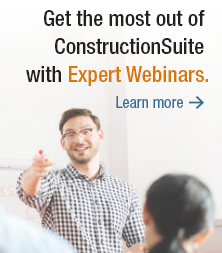 Take advantage of classification-based line item markup, automated dimensions, advanced reporting, and integration with the UDA Items Database, RS Means Cost Data, AutoCAD, PlanSoft, Cadsoft Envisioneer, QuickBooks, UDA Scheduling, and the rest of the ConstructionSuite system to build dynamic estimates that give you the power to track and manage construction costs. Easily create estimates, enter and track quotes from vendors, and update existing estimates or templates when prices change with the UDA Items Database. Pre-loaded with thousands of materials from RSMeans MeansData Costbooks, the UDA Items Database gives you instant access to both national average and adjusted local area pricing for materials. And, since it's fully customizable, you can create your own complete costbooks, add quotes, and modify existing information. As the industry standard in construction cost data, RS Means offers builders, contractors, owners, architects, engineers, facilities managers, and other construction professionals reliable construction cost information. Fully integrated into the UDA Items Database, RS Means Cost Data provides instant access to thousands of prices for material and labor costs, city cost indexes, and more. Don't let undocumented change orders affect your bottom line. Track, manage, and communicate project changes effectively using UDA Change Order management. With dynamic features in UDA Estimating that enable you to create a change order, designate a status (Pending, Accepted, or Rejected), and launch reports for both vendors and customers, UDA Change Order Management is one of the most advanced tools available for managing project changes. Protecting your company from undue financial liability has never been easier. With certificate tracking, you can ensure that subcontractors and others involved in your projects have up-to-date insurance, licenses, or bonds. Enter certificate information for projects or contacts, and enable Tracking Reminders to be warned of expiring certificates for all of your projects and resources. Go from CAD documents to a comprehensive estimate in just a few clicks using advanced integration with AutoCAD, SoftPlan, Cadsoft Envisioneer, Chief Architect, or eTakeoff. Create a Bill of Materials and easily import that information into UDA Estimating to create an estimate that includes item quantities and costs from your plan take-off. Save time and avoid costly accounting errors with the most powerful QuickBooks Integration available for construction Professionals. Enjoy a customized and flexible chart of accounts, automatically create QuickBooks estimates, invoices, and purchase orders; import actual costs into your estimate; record transactions in ConstructionSuite; and utilize UDA Insurance Tracking to ensure valid certificates before paying bills. Never again struggle with completing AIA 702 and 703 forms by hand. Automatically create and track industry-standard payment applications that you can print on AIA 702 and 703 forms. And, since Application for Payment is a part of the integrated ConstructionSuite system, information from your applications is stored in the database for each project. That way, ConstructionSuite is able to access previous application information and keep a running total of the payments for which you have applied. Forecast your company's finances with the Cash Flow Report. Based on expected completion dates, the Cash Flow Report shows predicted inflow of cash, so you can secure loans more easily, create strong working relationships with lenders, schedule draws, pay bills, and better manage your company's finances. Increase productivity by avoiding scheduling mishaps due to late or inaccurate information, double-handling of materials, waiting on resources, and dead time between tasks. Use UDA Scheduling to easily create comprehensive and dynamic schedules that deliver advanced Critical Path Tools, UDA Resource Allocation, Reminders, and numerous reports that are all designed to save you time and money. Plus, once you create and save a schedule, project subtasks will appear in the Integrated Calendar, making multi-project management a breeze. Integrated calendar tools merge your project and business activities into a dynamic calendar, giving you complete access to all your upcoming events. A much-anticipated addition to the ConstructionSuite system, the Integrated Calendar offers four dynamic views - Month, Week, Day, and List - with numerous options for customizing and printing each. With the Integrated Calendar and advanced reminders available for Activities and Project Subtasks, you and your team will always know what's next for your projects. Assign vendors, subs, equipment, and more in your ConstructionSuite Estimates and Schedules to avoid conflicts, send reminders, generate reports, and be warned of expiring certificates for your project resources. Create comprehensive schedules in UDA Scheduling that connect your project information to the ConstructionSuite database, then export a schedule to Microsoft Project to be viewed by subcontractors or others who do not have ConstructionSuite installed. ConstructionNet delivers breakthrough CRM technology with unbeatable project management power. The first CRM application developed solely for the construction industry, ConstructionNet enables you to leverage Contact and Project Information, Certificate and Lead Tracking, Project and Contact Associations, Activities and To Dos, and advanced Calendar functions to turn complex information into a sleek and streamlined system. Manage your company on the macro-level with Aggregate Reporting, a dynamic new feature that compiles and organizes all of your company's information. Multi-project capabilities bring together information across the ConstructionSuite database and enable you to sort information by a variety of options to view total number of projects, start and end dates, total estimated cost, total actual cost, and an array of information for each project. Organizing your project flow has never been easier. Take advantage of new Workflow Management tools and keep your projects progressing smoothly each time, every time. Workflows provide an outline of the steps you need to complete for each project, from the planning and pre-construction phase all the way through closing. Active items in the Workflow list can automatically open a template, file, program, or web site, making it easy for you and your team to create and reuse successful processes for all your projects. Secure more sales and raise your profits by organizing and managing your company's Leads. With UDA Lead Management, you can rate the viability of each lead, track referral sources, mark expected dates, and document all correspondence. Alleviate the tedious and time-consuming process of writing contracts on your own, and save thousands in legal fees by leveraging the comprehensive library of over 130 professionally-authored contracts and forms in ConstructionSuite. UDA Contracts link into the ConstructionSuite database, enabling you to create connections across your documents, projects, and contacts. Build client confidence and win more bids by including detailed specifications in your proposal package. Use the UDA Specifications Wizard to preview, edit, and select from over 300 specifications, then create a wizard template from your selections to save your customizations for future use. With UDA Document Management, rethinking and retyping the same information is no longer necessary, so you save time and increase accuracy. Use the Document Management Wizard to import contact information for any vendor, supplier, subcontractor, lender, or client, and quickly connect all documents to the ConstructionSuite database. Then, put a professional polish on your documents with easy-to-use features such as styles, letterheads, watermarks, and more. Managing large developments is tough enough, so you need to ensure that you have the right tools in place before you tackle a big project. Comprehensive documentation such as covenants, standards, and specifications keep your projects on target, while advanced estimates and schedules link into the dynamic Aggregate Reporting system. Maximize your employees' productivity by giving them access to the shared resources you know they need. With advanced networking, UDA ConstructionSuite makes it easy to share all of your company's data, including contacts, projects, files, and more with every member on your team. New automated check in/check out process makes it easy for multiple people to work from the same database while avoiding costly and time-consuming mistakes. You need your data at the office and on the go, and you need it to be updated and correct. Although the primary means of sharing information when you purchase additional licenses is to have multiple users log in to a single database, UDA ProjectSync has you covered when it's necessary to work outside the office network on a laptop or tablet PC. With UDA ProjectSync, you can choose which projects to synchronize and what computers to include and synchronize on demand for instant information sharing or schedule regular synchronizations to ensure that each computer always has the latest information. Guard your company against massive data and profit loss with a regular back up to removable media or another computer on the network. With UDA ProjectBackup, you can effortlessly back up your entire ConstructionSuite database, including project information, files, contacts, and items. And, by scheduling automatic backups, you can ensure that your data is always protected and make it easy to recover from data loss with simple import and restore options. Mobile Integration is back - bigger and better than before in the new UDA ConstructionSuite. While you can still create optimized read-only copies of your project management files to take with you on your PDA or pocket PC, the new UDA Mobile Integration now enables you to synchronize the UDA Construction Calendar with Microsoft Outlook, so you can view project schedules in the field and manage Activities in Outlook before synchronizing back to UDA ConstructionSuite. UDA ConstructionSuite is a powerful, dynamic system with thousands of advanced features designed for managing construction. With twenty specialized versions, you can select the system that best fits your business needs. These screenshots are intended to highlight a few of the features included in UDA ConstructionSuite. However, not all ConstructionSuite versions include every feature described above. Refer to the Compare Versions web page to view a comprehensive list of features included in each version of ConstructionSuite. Microsoft Office, Microsoft Project, and QuickBooks are not included with ConstructionSuite. ConstructionSuite and ConstructionNet are trademarks of UDA Technologies, Inc. RS Means, RSMeans, and MeansData™ Costbooks are trademarks of Reed Construction Data. To upgrade your ConstructionSuite system, please contact a UDA Technologies representative at 1.800.700.8321, Monday through Friday 9 a.m. - 7 p.m. Eastern time. UDA Technologies is proud to announce that Construction Executive Magazine has honored ConstructionOnline™ and ConstructionSuite™ with the prestigious Top Products Awards of 2019. UDA Technologies is proud to announce that ContructionOnline™ is trusted by over 550,000 construction professionals worldwide. UDA clients range from Fortune 100 member Marriott, the world's leading hospitality company, with 21 brands including: Ritz-Carlton, Marriott, Renaissance, Courtyard, Fairfield Inn, Ramada and Residence Inn, to over 550,000 successful Construction Professionals across the United States, Canada, and 75 countries worldwide.